Mache (Valerianella locusta) is a type of lettuce that is part of the Valerianaceae family. This small annual plant originated from the temperate zones of Europe and is now a major crop of Nantes, a city in western France and the leading producer of mache in Europe. It is also known as “lamb’s lettuce” because the size and shape of individual leaves bear a resemblance to the tongue of a lamb. Mache has grown in popularity as a salad green thanks partly to the sweet, nutty flavor of its leaves, and its reputation as one of the most nutritious varieties of lettuce. Unlike the more famous iceberg lettuce, mache is loaded with vitamin C; so much so that a 3.5-ounce serving can deliver 64 percent of the daily value of vitamin C, putting mache on the same level as lemon juice. Mache has a high concentration of iron, the mineral needed for healthy red blood cells. This makes mache one of the best foods for menstruating women and people suffering from anemia. Moreover, iron can diminish the chances of premature births and underweight newborns, so pregnant women are also recommended to eat mache. A four-ounce serving of mache has over 250 mg of omega-3 fatty acids. These substances not only lower triglyceride levels in the blood, but they also increase the amount of high-density lipoprotein (HDP) or good cholesterol. Therefore, mache is an excellent food to eat for a strong heart. Mache can have a hand in maintaining a smoothly functioning digestive system due to its density of manganese. Without manganese, digestive enzymes wouldn’t be able to form properly. Without properly formed digestive enzymes, the efficient utilization of digested food wouldn’t occur, nor would the absorption of fat during digestion. Mache is regarded as a great source of vitamin B6, a B-vitamin that contributes to the body in a multitude of ways. Vitamin B6 aids in brain function and development and boosts metabolic rate, meaning mache is a food that supports both the mind and metabolism. Mache can be eaten raw, with just a light sprinkling of vinaigrette to enhance its signature taste; toasted walnut oil and sherry vinegar also make good dressings for mache. 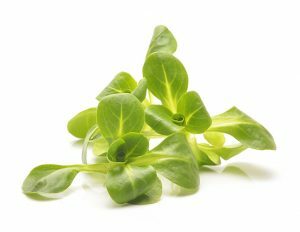 If used in a salad with other greens, the ones mache goes well with are rocket, frisée, mustard leaves, and dandelion. Furthermore, raw mache can be paired with more hearty dishes like poultry, scallops, fish, and cold pasta. Cooking mache is not recommended, however it can be steamed or sautéed for a few minutes, and fried for a few seconds. Mache that has been lightly cooked can be used in soups, rice, or omelets. Note: although children can be fed raw mache, it’s best to avoid giving it to infants below the age of two years unless it’s been cooked, blended into a soup, or mixed with mashed potatoes. Mache is an ideal food choice for menstruating women and people suffering from anemia. Mache promotes a healthy cardiovascular system. Mache also plays a role in maintaining a functioning digestive system. The vegetable is also an excellent source of vitamin B6.